Sweet Dreams Chocolate Company has been in the Sterling family for generations, ever since Great-Grandma Rose literally dreamed up her first fabulous recipe. But now it looks as if they're about to lose Sweet Dreams to the bank—and that would be a disaster, not only for the family but for the town of Icicle Falls, Washington. Can Samantha, the oldest daughter and new head of the company, come up with a way to save it? After Samantha does some brainstorming with her mother and sisters, inspiration strikes. They'll have a chocolate festival! Time's running out, but the Sterling women are determined and the town's behind them, so everything's bound to go smoothly…. Sheila Roberts lives on a lake in the Pacific Northwest. Her novels have appeared in Readers Digest Condensed Books and have been published in several languages. Her book Angel Lane, was an Amazon Top Ten Romance pick for 2009 and her holiday perennial, On Strike for Christmas was made into a movie for the Lifetime Movie Network. You can visit Sheila on Twitter and Facebook or at her website (http://www.sheilasplace.com). 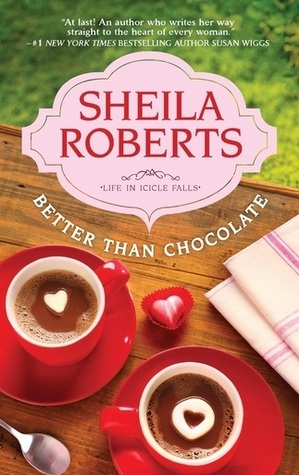 Welcome to Icicle Falls, home of the Sweet Dreams Chocolate Company, a company that is now on hard times since Samantha's mother, marries a spendthirft and the finances really unravel when Waldo dies suddenly. As the oldest daughter, Samantha has been the heart and soul of the company. Her younger sisters come home for the funeral but have lives of their own and leave Samantha to fix everything. The bank manager, Blake, tells her in no uncertain terms that her time is near the end and she either has to pay up or get out. To raise awareness and get more business, Samantha comes up with a brilliant idea to have a chocolate festival in the small town and the whole town rallies around her. The history between Blake and Samantha causes a bit of resentment on Sam's part and places an interesting twist on that relationship. Cecily and Bailey try to help their older sister save the business but they each have their own busy lives to contend with. I hope to see more of them in future installments since they both seem very interesting. The story is filled with wonderful bits of humor woven in the wonderful dialogue and with just the right touch of descriptions. I was really reminded of Jill Shalvis's stories and think this series will help me through those times that I have to wait for a new one. Fans of Susan Mallory and Roxanne St. Claire will love this new series. Contest is open to anyone over 13 years old with US or Canadian mailing address Void where prohibited. I love the cover, the name of the town and the idea of a Chocolate Festival! Thanks for the chance to win! I can't resist this book - I'm a chocoholic! Thanks for the giveaway; love food related books. I always take note when Chocolate is mentioned! This book sounds good, and I really love the cover. Thanks for having the giveaway. Alicia B is the winner!